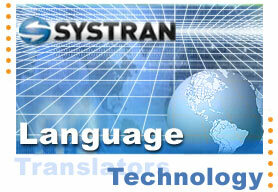 Systran Translation software is also called Machine Translation. A process that utilizes computer software to translate text from one natural language into another. This definition accounts for the grammatical structure of each language and uses rules and assumptions to transfer the grammatical structure of the source language (text to be translated) into the target language (translated text). Translation is anything but simple. It's not a mere substitution for each word, but being able to know "all of the words" in a given sentence or phrase and how one may influence the other. Human languages consist of morphology (the way words are built up from small meaning-bearing units), syntax (sentence structure), semantics (meaning), and countless ambiguities. SYSTRAN was one of the first and is one of the few remaining independent Machine Translation (MT) developers. In 2002, SYSTRAN releases a redesigned architecture that in simple terms, leverages its 30 plus years of enhancements that make the overall system more efficient. Combined with the increased performance in today's computers, this results in higher translation coverage. SYSTRAN's technology is developed under Linux and runs on all Unix platforms and Microsoft Windows. All SYSTRAN systems utilize one engine and use the latest Natural Language Processing (NLP) technologies. The systems integrate finite state technology to accelerate access to very large linguistic knowledge bases. In fact, SYSTRAN has more multilingual knowledge bases that common computers can support. XML, Unicode and HTTP standards are central in the design to address multilingual issues in applications such as Web, email, Intranet, publishing, etc. SYSTRAN's R&D efforts benefit from continued development and reinvestment in linguistics and in NLP. The goal is to prepare new generation MT systems to improve translation quality and robustness over multi-agent, multi-threaded architecture. Customizing the software can increase the accuracy of the translation by using industry specific dictionaries, which are included in the premium version and by building our own customer specific dictionaries. You can also build a list of words you do not want translated, for example, company names. It is important to distinguish between generic MT and customized MT. The SYSTRAN technology powering most of the Internet portals is a generic translation service that is based on the largest possible dictionaries. Its aim is to provide a "gisting level" translation service, such as looking at a foreign page and being able to understand the main lines of the page. The system must obtain not only a correct syntactic analysis of the text, but also a correct semantic analysis. This is because some words will have different meanings and syntactic behavior, depending on the semantic context in which they are used. Even with the important specialized dictionaries the quality of the translation cannot always be fully satisfactory because of the total freedom and productivity of content on the web; the dictionaries selected cannot be the exact domain glossary due to extreme diversity; and the impossible task of having a complete description of all possible domains (a problem not only of cost, but of expertise). The key point is that no generic MT system today can solve all translation problems. Although Systran is considered the best it will still not replace a human translator, language is to complicated but you can increase the accuracy of the translation the software delivers by creating your own customer specific dictionaries and customizing the software with your company's or industry's terminology. Systran will give you a rough draft of the translation that can be edited further for more accuracy. This time savings alone makes the investment into translation software a wise choice.